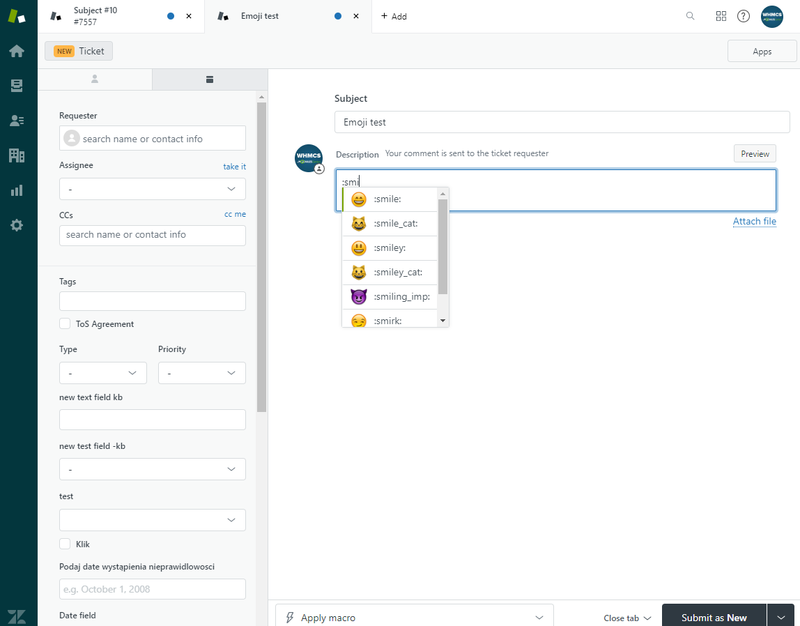 Zendesk For WHMCS replaces the standard WHMCS support system with the complex choice of Zendesk tools. The module will enrich your client area with various extra features, allowing customers to e.g. fill in Zendesk ticket fields and use emojis. 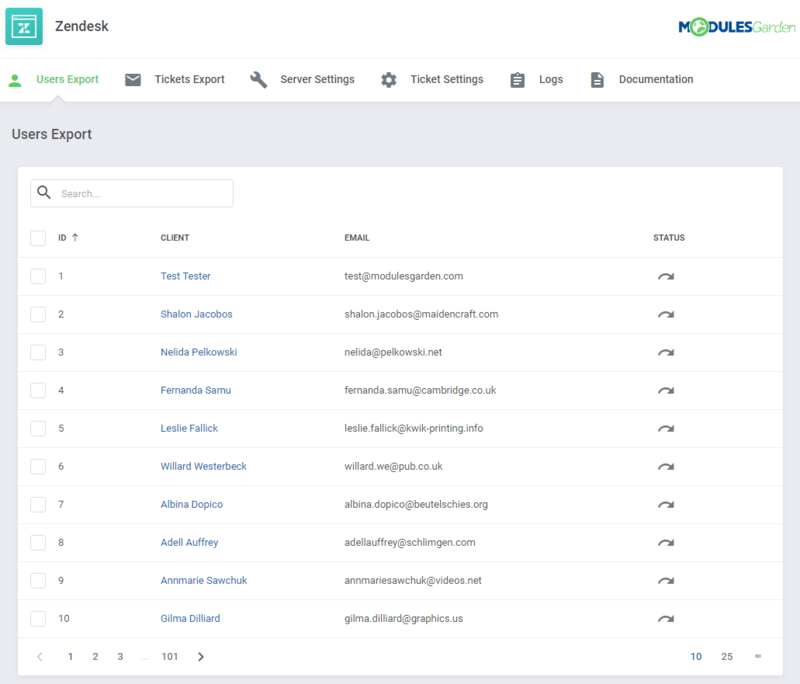 At the same time, you and your staff members will be free to monitor and manage every ticket created in WHMCS straight from within the Zendesk admin area. 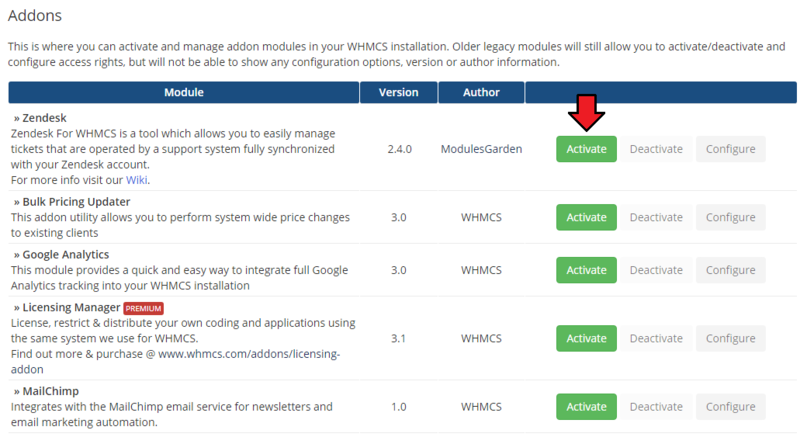 This tutorial will show you how to successfully install and configure Zendesk For WHMCS. 1. 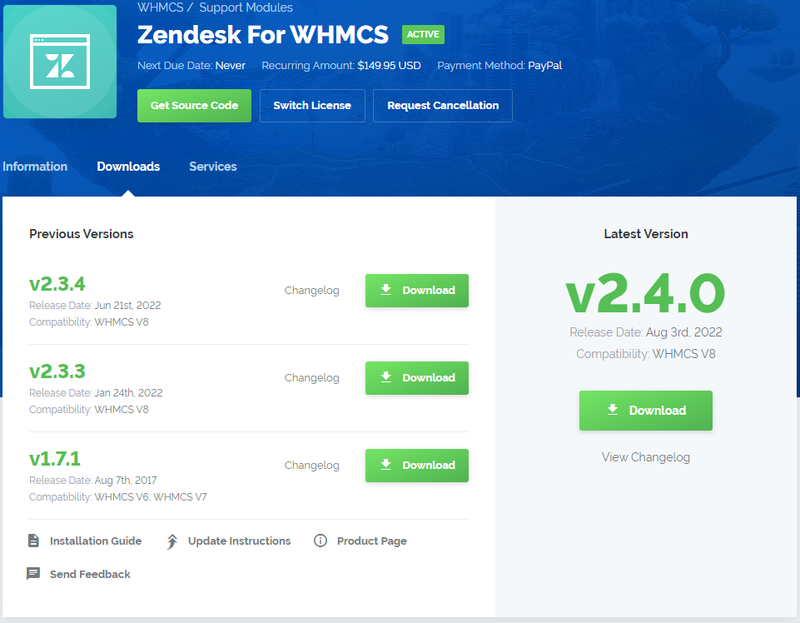 Log in to our client area and download Zendesk For WHMCS. 4. 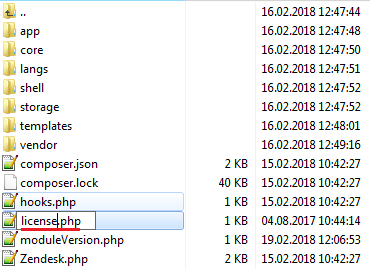 When you install Zendesk For WHMCS for the first time you have to rename 'license_RENAME.php' file. File is located in 'modules/addons/Zendesk/license_RENAME.php'. Rename it from 'license_RENAME.php' to 'license.php'. This folder is available at 'your_whmcs/modules/addons/Zendesk/'. Afterwards, find 'Zendesk' and press 'Activate' button. 9. You have just successfully installed Zendesk For WHMCS! 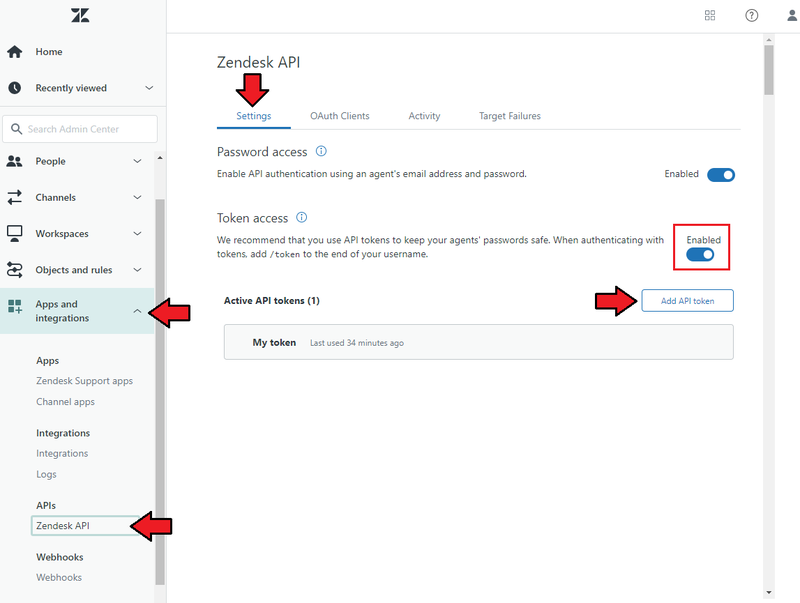 Before we proceed to the configuration itself, you have to generate your API details to connect with your Zendesk account. Go to 'Admin' → 'Channels:' 'API'. There, in the 'Settings' section find 'Token Access' and enable it. Add a new token or use an existing one if you already created it. Important: Make sure to copy and store this token. It won't be shown again after you click 'Save' or leave this page. You will also need it in a moment to complete the configuration of the module. Now go to 'Settings' → 'Security' section where you can enable 'Single-Sign On'. The action is optional. and after logging in, they will be again redirected and automatically logged into the Zendesk panel to view the ticket. Next, scroll down to the bottom of the page and find 'Shared Secret' section. Press 'Regenerate' to get a new shared secret token or use an existing one. Copy and keep your 'Shared Secret' in a safe place. You will need it in the next step. Note: The 'Shared Secret' is not required for Zendesk module to work itself. It is needed for SSO only. Don't forget to press 'Save' button, you will find it at the bottom of the page. 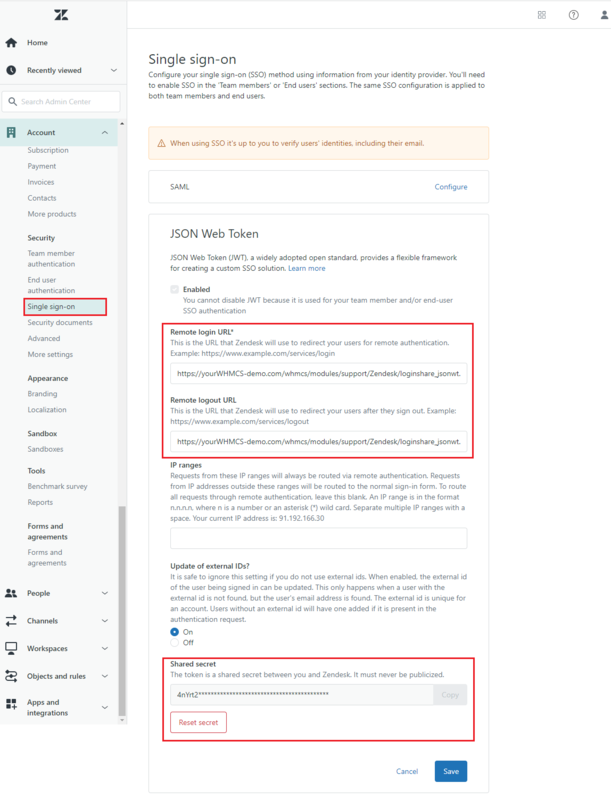 Now, that you have safely stored API and Shared Secret tokens, you may move to the second part of the configuration process. 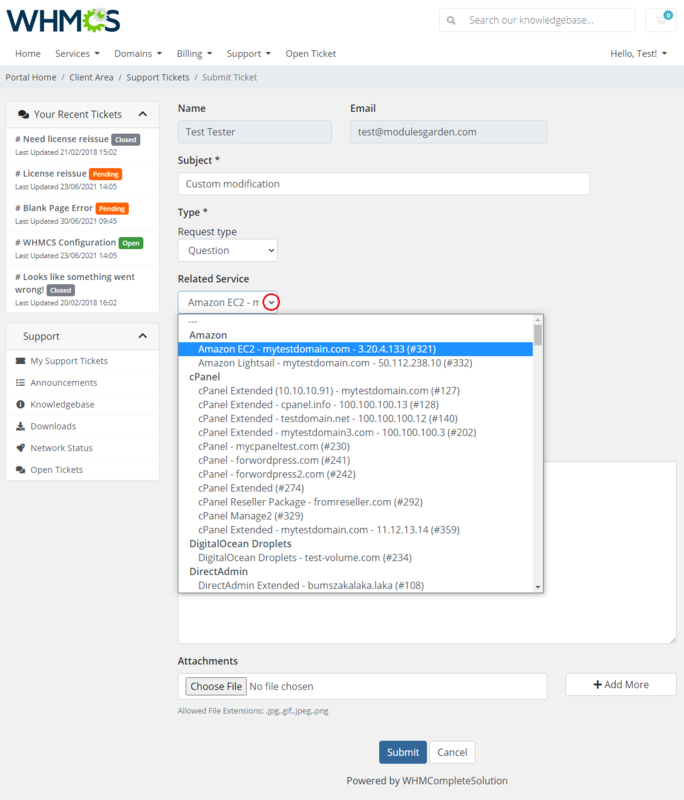 Proceed to 'Addons' → 'Zendesk' → 'Server Settings', this is where you have to enter any data required to connect your WHMCS with the Zendesk server. Test the connection, to ensure that all credentials are correct, save the changes if the test ends with success. Next, move to 'Setup' → 'General Settings' → 'Support'. 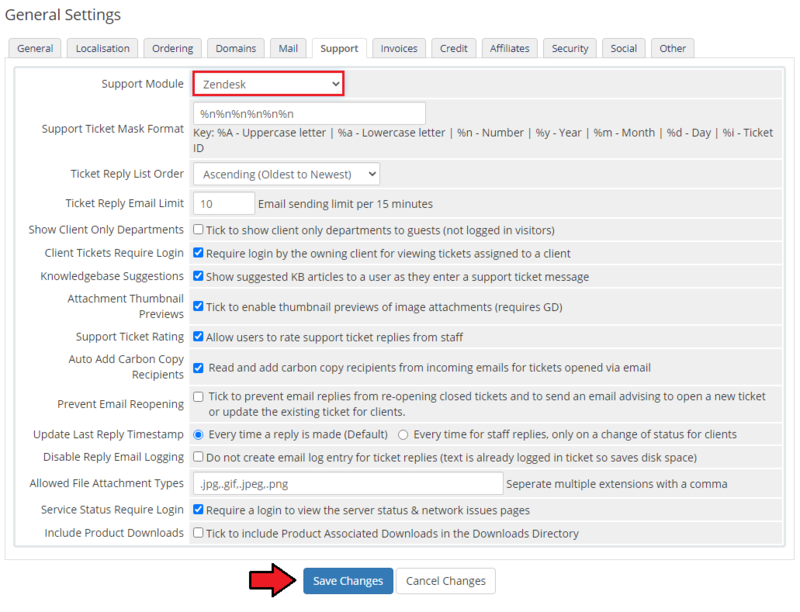 Choose 'Zendesk' support module form a dropdown menu and save changes afterwards. Note: From now on, your clients will see Zendesk tickets and departments (not the ones of WHMCS). Good job! 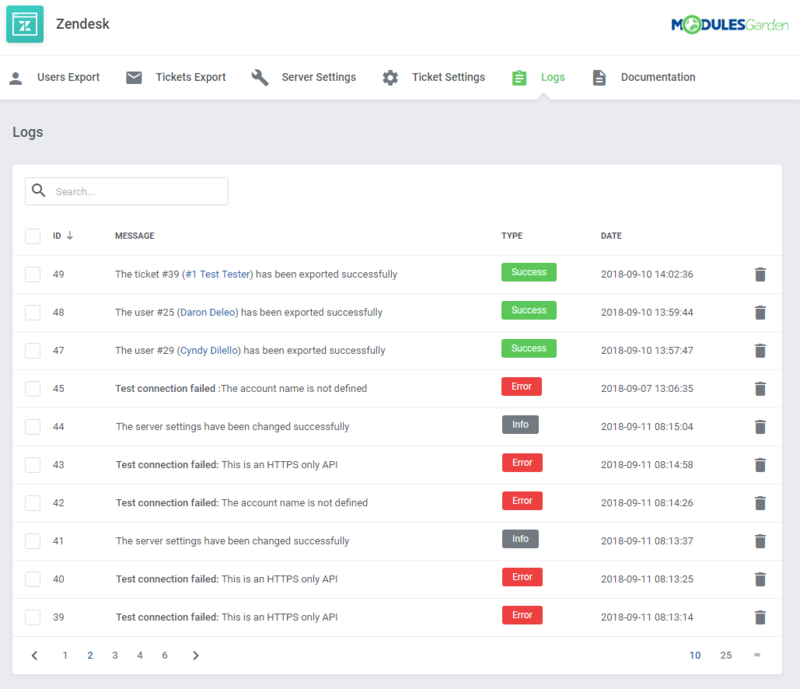 Now your WHMCS is connected with the Zendesk support system. 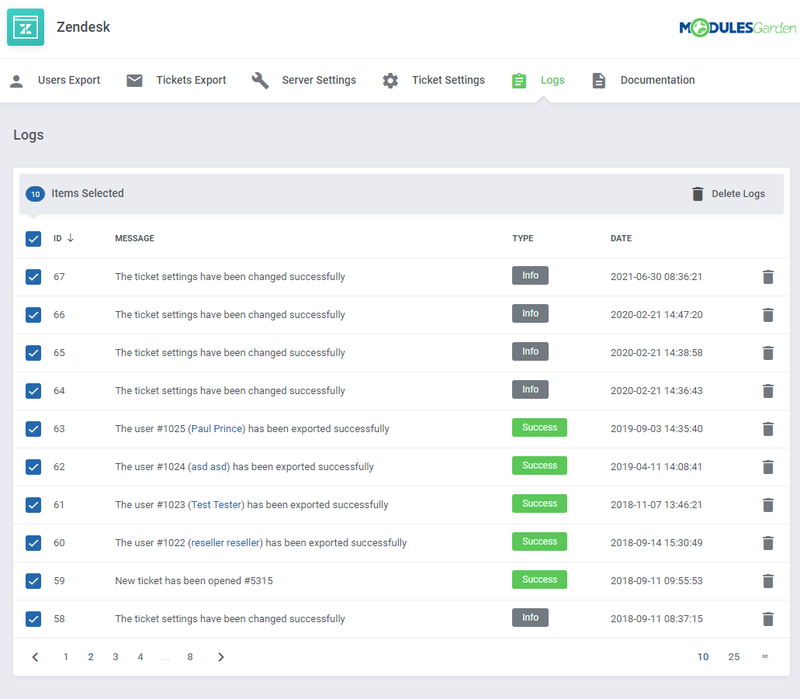 Once Zendesk For WHMCS is installed and the connection configured, you can either create or update your ticket departments and start using them. 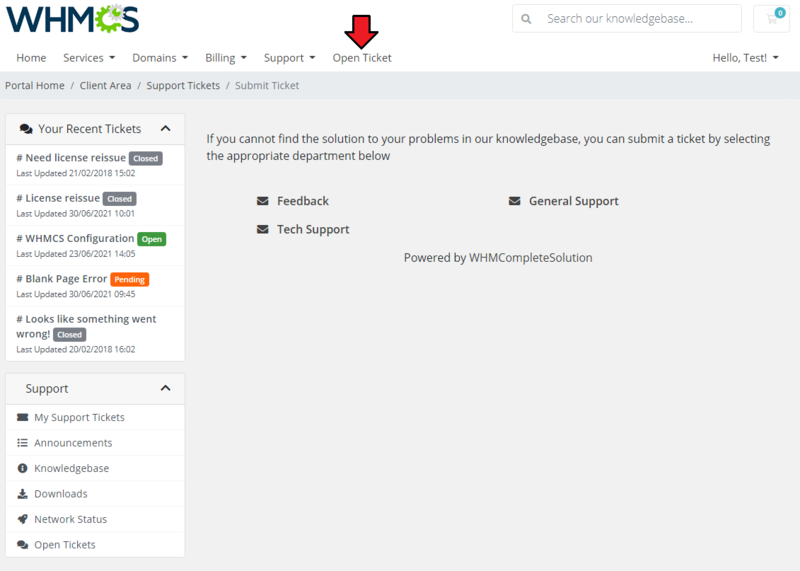 Each ticket department you create in Zendesk will be available for your customers in the WHMCS client area. 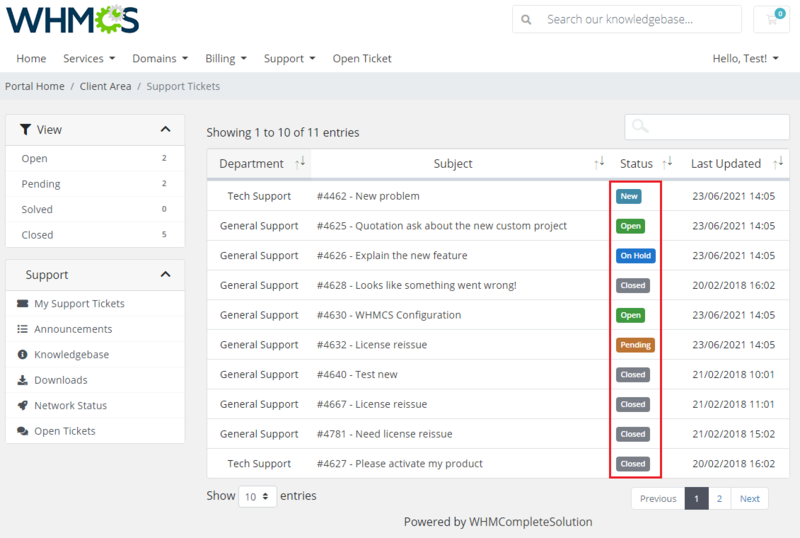 Before you start your actual work on support tickets with Zendesk For WHMCS, move again to 'Addons' → 'Zendesk' → 'Ticket Settings'. 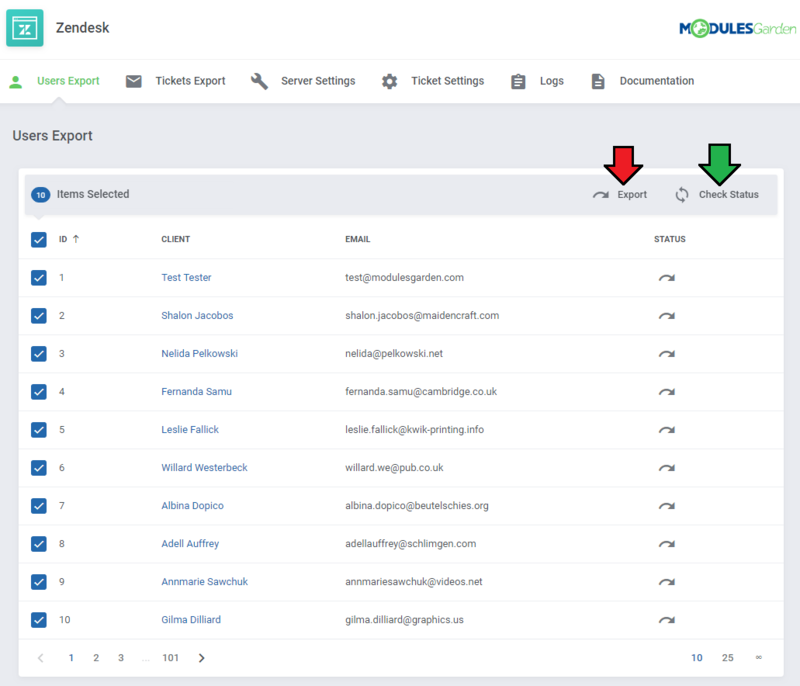 This section of the addon allows the easy and comfortable management of the form in which tickets are displayed in your client area, their visibility, sorting properties, etc. In the first box 'Options', you can enable several basic settings that will be applied to the tickets view in the client area. Contact Us Department - select a default department for tickets sent from visitors via the "Contact Us" page. 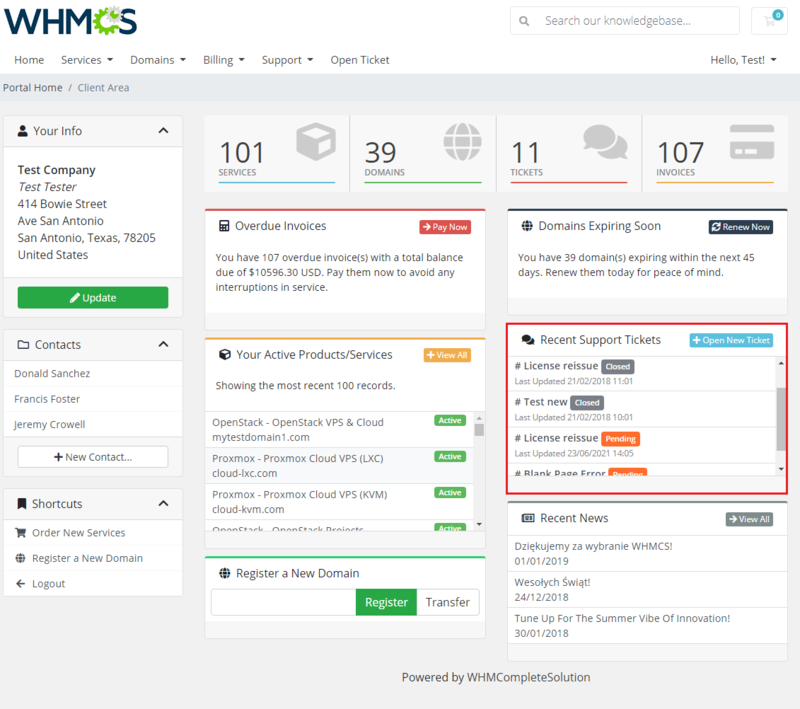 In case the "Contact Us Integration" option is disabled, a WHMCS department, selected at WHMCS → Setup → Mail → Presales Form Destination/Presales Contact Form Email, will be applied to such tickets. Template Name - Change only if you want to use a custom template. Below the 'Options' box you will find a box where you can assign colors to a specific ticket status. Click on the field to choose a color from the palette or type in the number of the color you like. Remember to save the changes if you modify the ticket settings in any way. Tickets will be now marked with selected colors on the homepage according to the status they have. The color settings will be also viewable on your main tickets list. 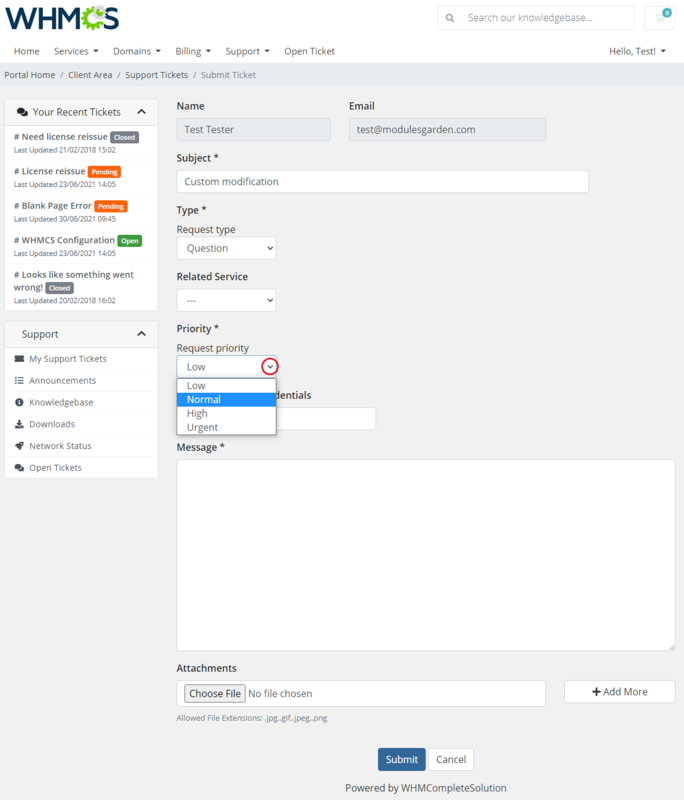 You can also manage ticket fields that are available in WHMCS on a new ticket form, directly in Zendesk. Move to 'Zendesk' → 'Admin' → 'Manage' → 'Ticket Fields'. On this site, you can activate, deactivate or edit any system and custom fields or add new ones. For test purposes, we activated and adjusted the 'Priority' field according to our needs. 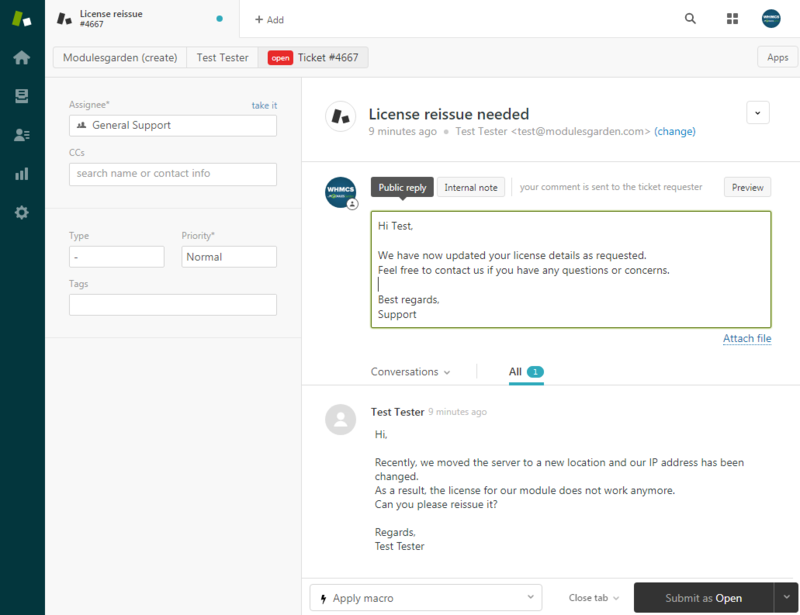 As you can see on the screen below, a new field appeared in the WHMCS client area. Edit or add ticket fields to adjust the ticket form to fit your needs perfectly. The 'Client Service' field allows your customers to specify the service they refer to when creating a ticket. This can help your support teams more easily identify the problem with the service used by the client. Move to 'Zendesk' → 'Admin' → 'Manage' → 'Ticket Fields'. and press 'add custom field'. Choose the Text type to add your new ticket field. We will now adjust the 'Client Service' field according to our needs. First, enter the ticket field's name. 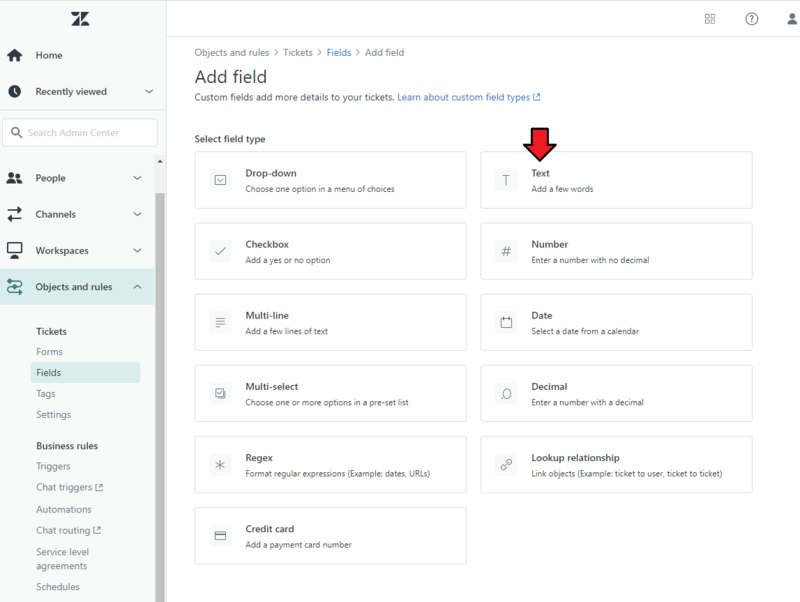 Then, select 'Visible' and 'Editable' options and make sure to leave the 'Required' box unchecked to keep this field optional for the clients when they open a new ticket. 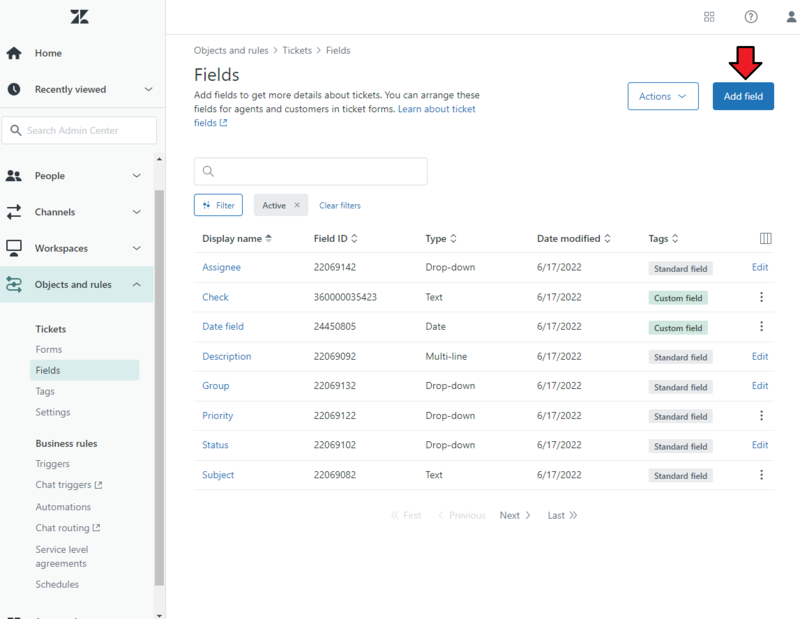 Once you have created your new field, you can select it as 'Client Service' in the 'Ticket Settings' section of Zendesk. 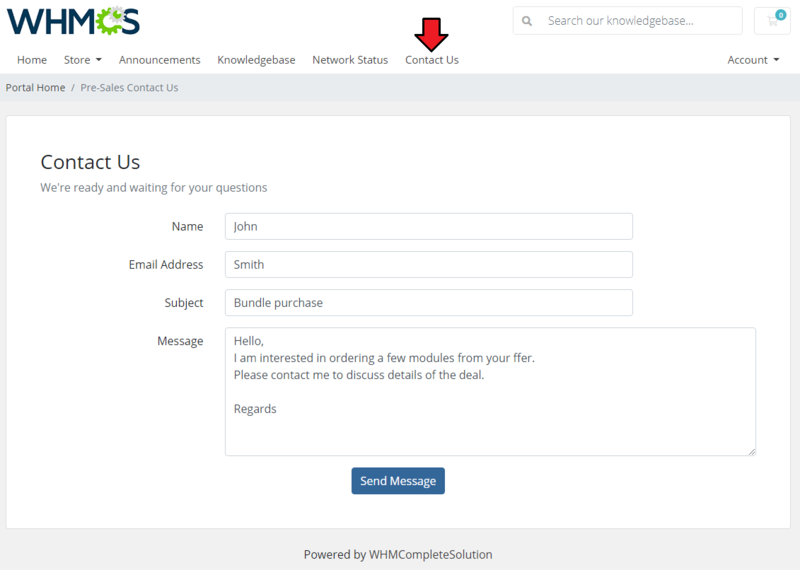 As you can see on the screen below, a new field, which may help to draw the agent's attention to a specific client's service appeared in the WHMCS client area. 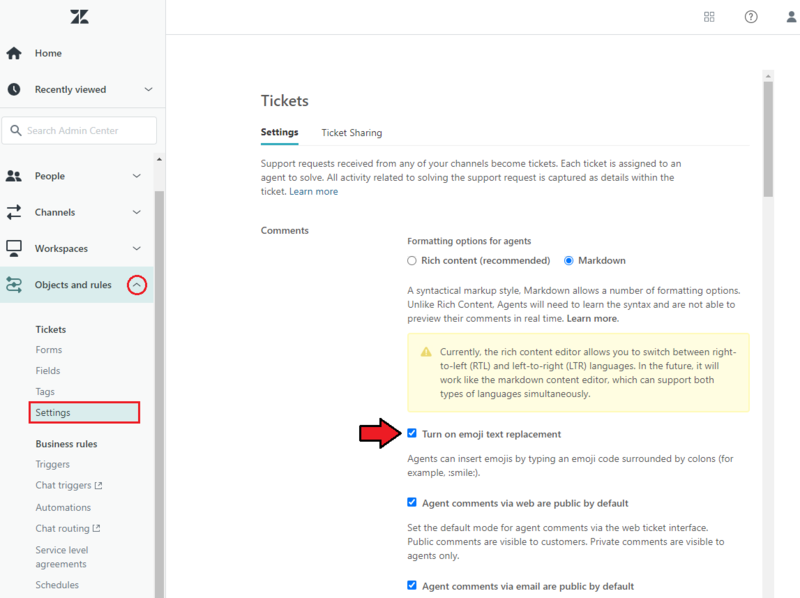 Next, when the agent access the ticket in the Zendesk panel, there will be information about the service selected by the client. Our module allows you to export data gathered in WHMCS, more specifically, all the users and tickets generated before the installation of the product. 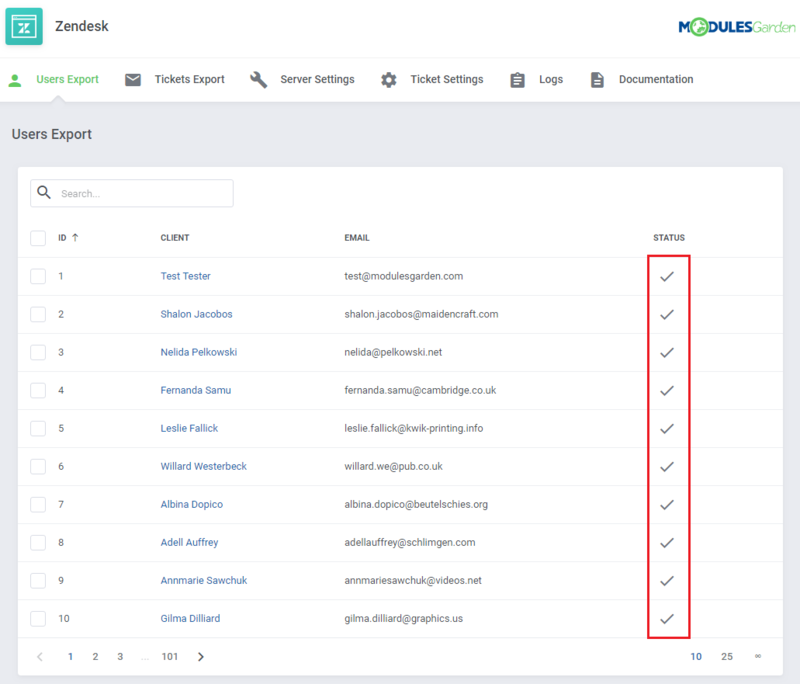 Read the below points to learn what data can be synchronized with Zendesk and what are the possible means of such synchronization. 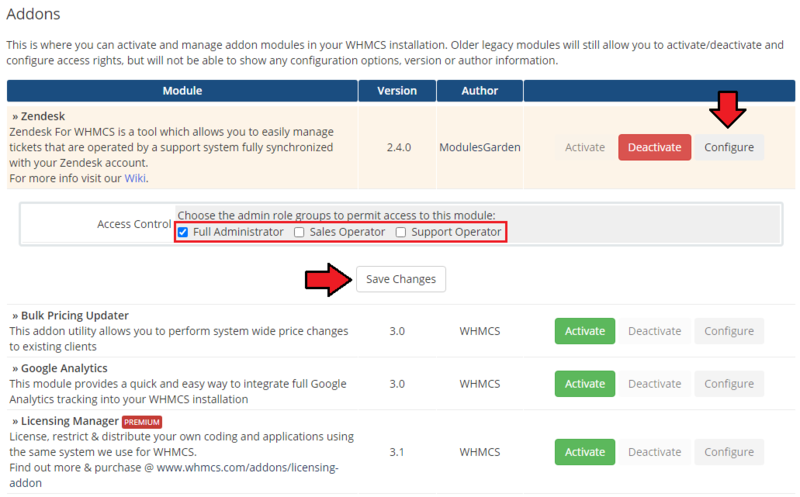 The first option offered by our module is the export of users from WHMCS to Zendesk, proceed to 'Users Export' . 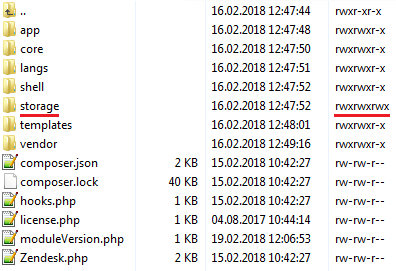 If you are using Zendesk For WHMCS for the first time, you will see here a list of all users who exist in your WHMCS and have not been synchronized with Zendesk yet. Now, you can manually export all of the users available on the list or choose only some of them. Check boxes next to the users you are going to export and press the 'Export' button, marked with the red arrow on the screen. You can always check the status of the exported clients. 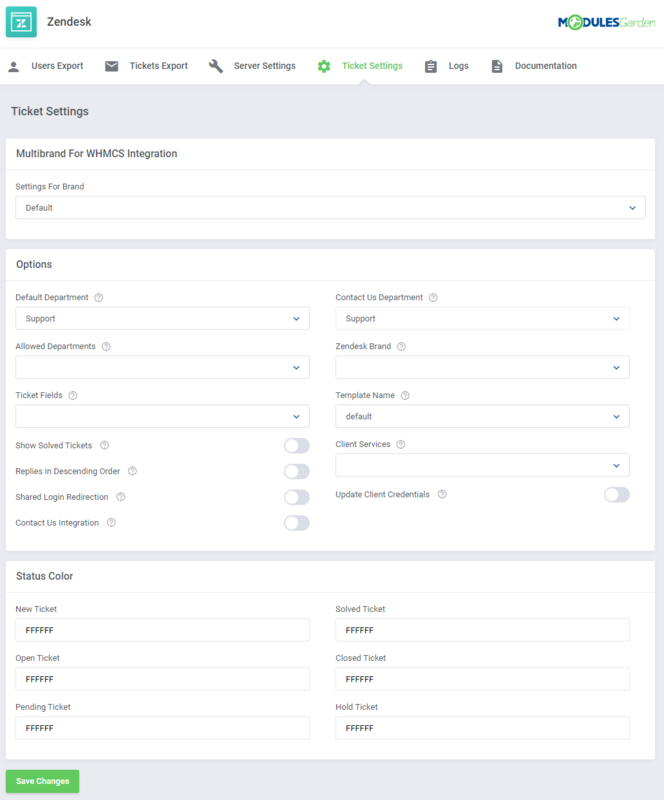 After confirming your choice, the selected users should be exported from WHMCS to Zendesk, their 'Status' field will become modified as well. All users newly added to WHMCS will be automatically synchronized with Zendesk. 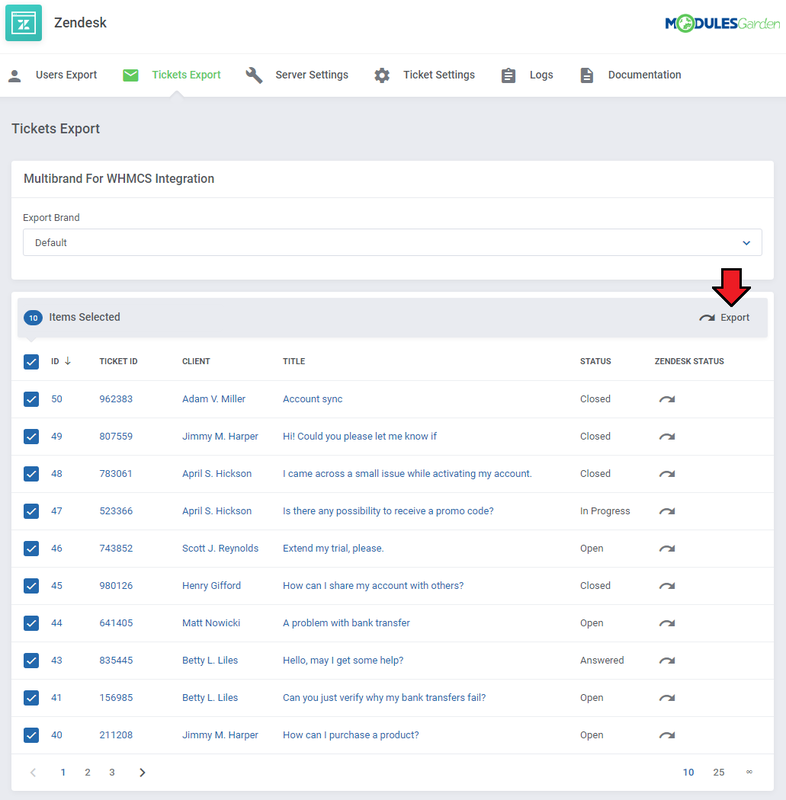 The next option offered by our module is the export of tickets from WHMCS to Zendesk, proceed to 'Tickets Export'. 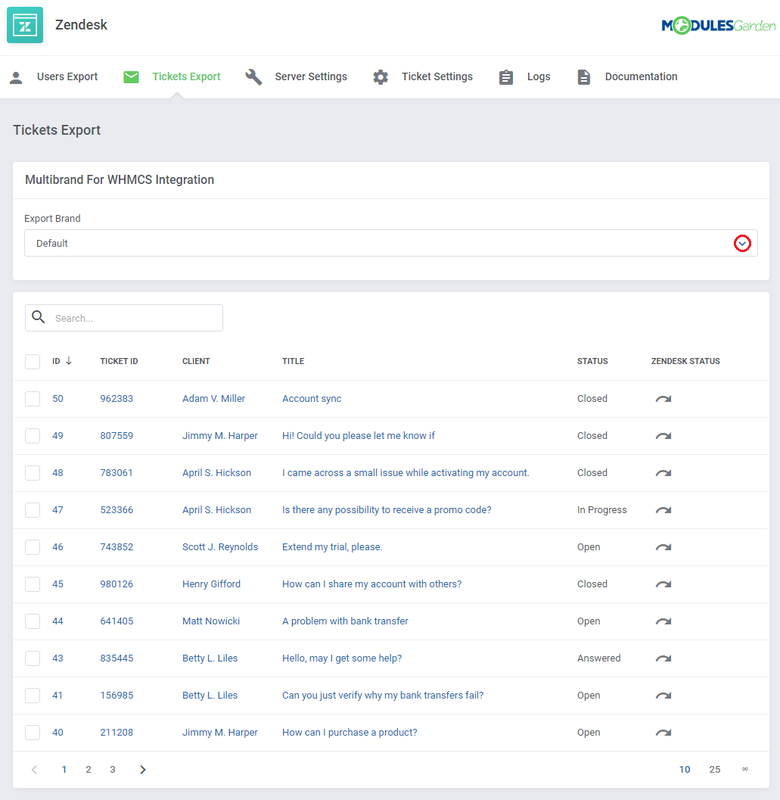 You will see here a list of all tickets which exist in your WHMCS and have not been synchronized with Zendesk yet. Check boxes next to the tickets you are going to export and press 'Export' button as marked on the screen. Next, confirm the default department you have chosen in the 'Ticket Settings' , or select one of the other available departments. If a ticket has already been exported from WHMCS to Zendesk, it gets an "Open" status in Zendesk. All module activities are recorded in 'Logs' . Note: You might have no logs visible here if there are no logged actions yet. In case you no longer wish to see a particular log you can easily remove it. Select a particular entry and click on the bin icon as presented on the screen below. In order to delete multiple logs at the same time you can simply take advantage of the 'Mass Remove Action'. Move to your client area. There, on the homepage, a 'Recent Support Tickets' box can be found. It presents the latest tickets available in your system. The visible tickets are marked with colors related to their current status. Now, we will submit a ticket to show you the complete creation flow. Just like in case of a standard WHMCS support ticket, choose the department. Note: For convenience, if you have only one department configured, you will be moved immediately to the ticket creation view. 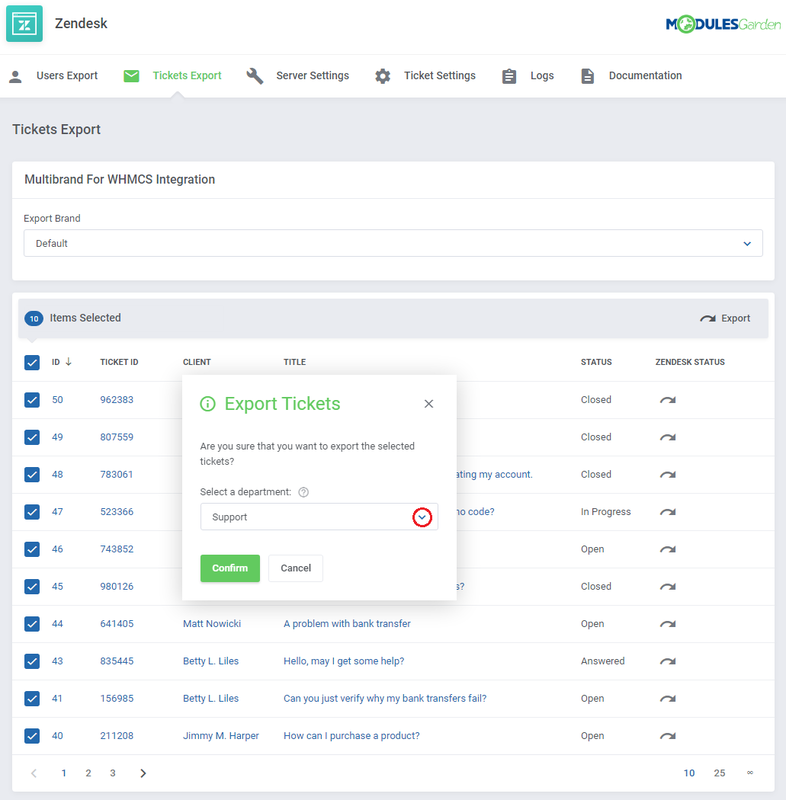 Next, enter the subject, type in the ticket message and fill in any additional ticket fields that you feel are useful and will help you quickly receive a satisfactory answer. A new ticket, sent with Zendesk For WHMCS module, is immediately visible in the Zendesk admin area. The client has received an answer. Note that the ticket status has been updated as well. 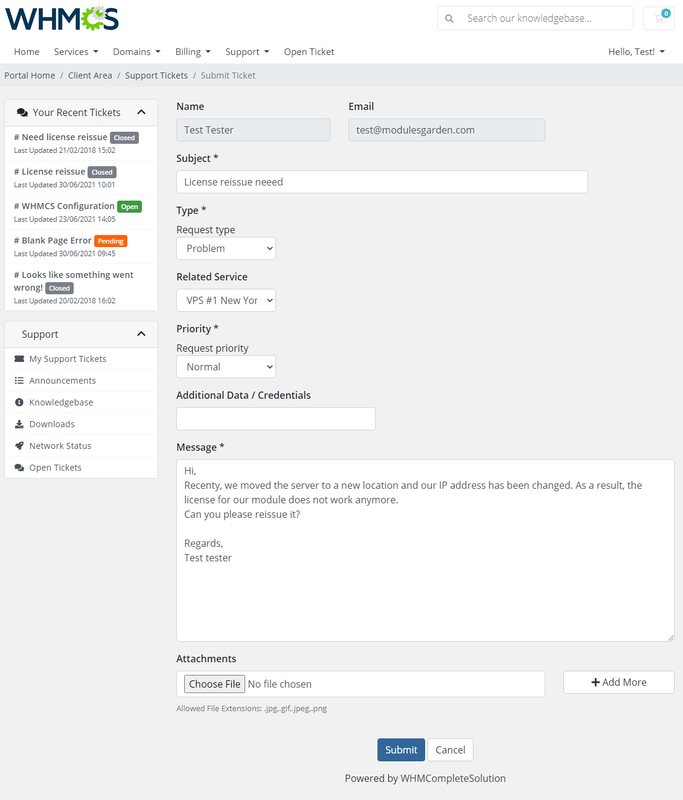 The module allows also the unlogged users to send tickets via the 'Contact Us' form. Such ticket will be delivered to a department previously defined by the admin. 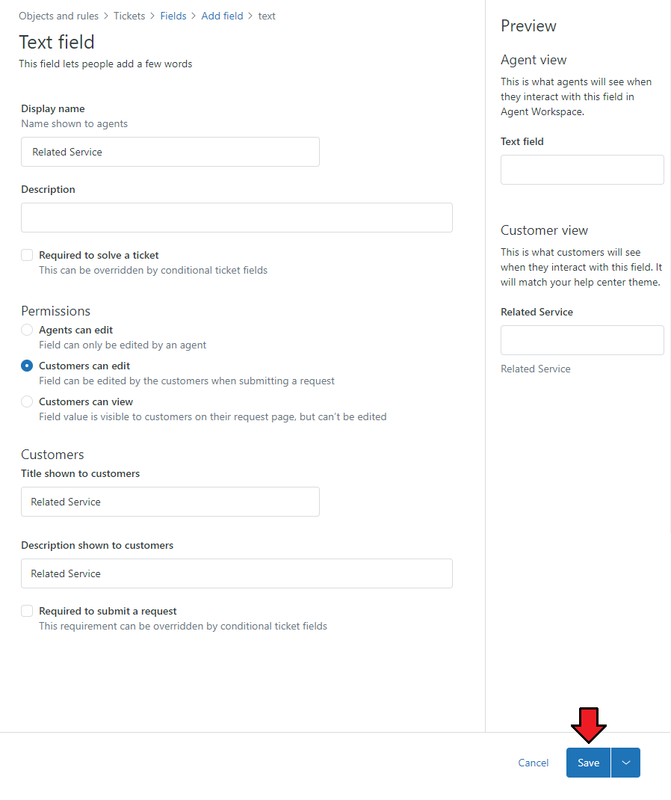 Please refer to the 'Ticket Settings' section here to see how to configure the 'Contact Us' integration and department. Since 2.0.0 version of the module, agents can use emojis (emoticons) without worrying that these will not be displayed to the clients in WHMCS. First, you need to enable support for them in your Zendesk Panel. Go to the 'Admin' → 'Settings' → 'Tickets' and tick the 'Enable emoji text replacement' option. 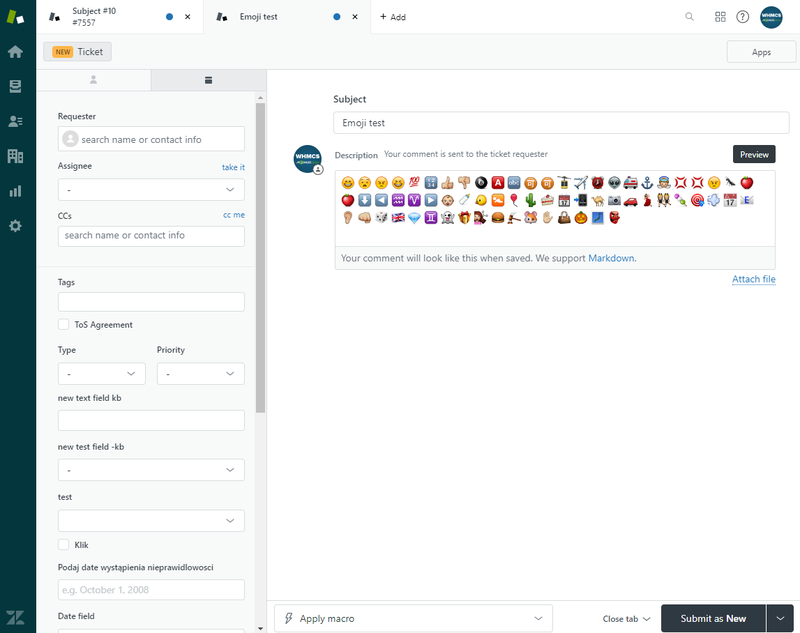 Now, your agent can insert emojis by typing an emoji code surrounded by colons (e.g. :smile:). You can use a lot of different emojis. Press the 'Preview' button to see how they will look like in the ticket. 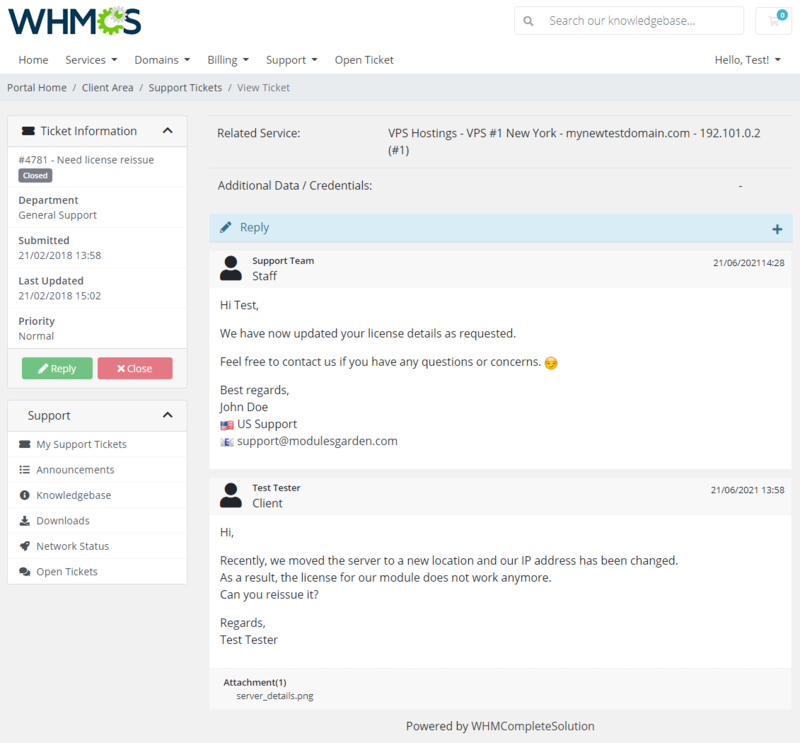 After sending the reply, the emojis will be displayed in WHMCS to your client. Note: Due to the licensing issues, the appearance of emoticons used in the module is slightly different from those used by Zendesk itself. Moreover, a very small part of the emojis supported by Zendesk may not be yet included in the set used in the module. Click here to see the list of emojis supported by the module. Your customers can also use emoji codes in WHMCS, but it is not possible to preview them before sending a ticket. The workaround for this inconvenience will be presented in the near future. 1. If you create a custom field in Zendesk, it will also be visible in WHMCS. 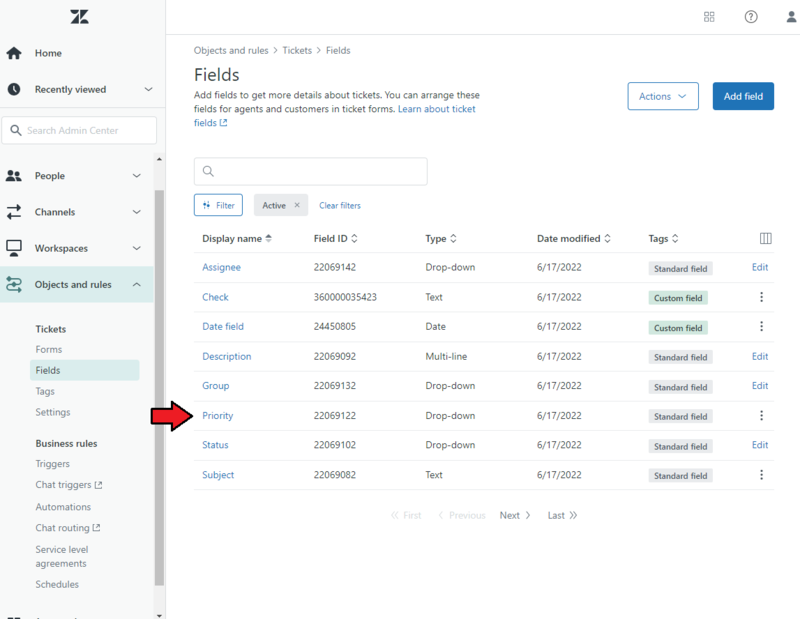 Custom fields need to be enabled, visible and editable by client. option is currently the only available one. To enable this option, proceed to Zendesk → Business Rules → Automations. Find the option and edit it. 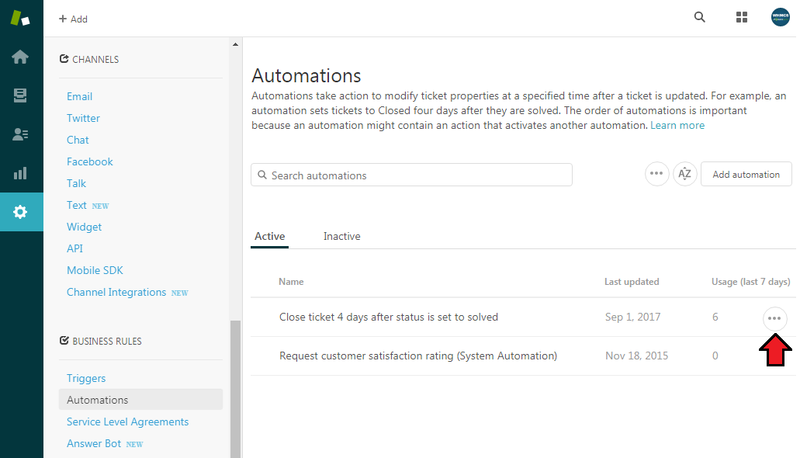 Here you can configure the time period within which the tickets can be reopened by an answer from the client. Extend the maximum time to your needs. 3. Attachments are managed in Zendesk, therefore if you do not enable them in Zendesk, your clients will not be allowed to add them in the tickets. 4. If you would like to use multiple brands, first make sure you have 'Zendesk Support Multibrand' ' option enabled in your Zendesk account. Go to 'Zendesk' → 'Settings' → 'Account' → 'Branding'. Note that multibrand support may require the enterprise plan. 5. 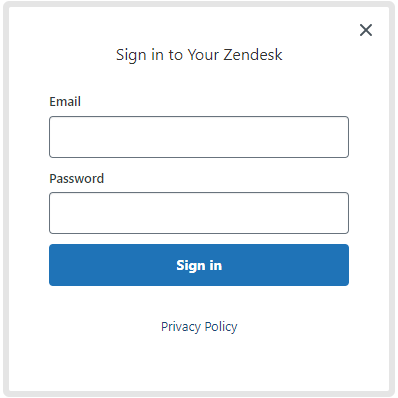 If you use SSO, you can still access your Zendesk panel in a normal way. Simply go to: https://YourZendeskSubdomain.zendesk.com/access/normal and enter your access details. 2. When you try to open a new ticket and you get the 'Unable to authenticate' error, this means that the user's email is already registered in Zendesk, but it has not been verified yet. 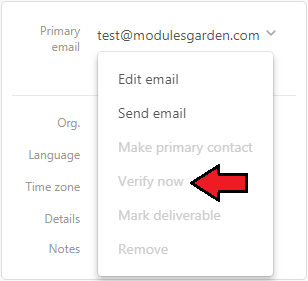 To solve the problem, log in to your Zendesk admin area and verify the email by clicking 'Verify now' as presented on the screen below. 3. If you encounter a problem when performing the export of a lot of users, make sure you are not using the Zendesk trial account. 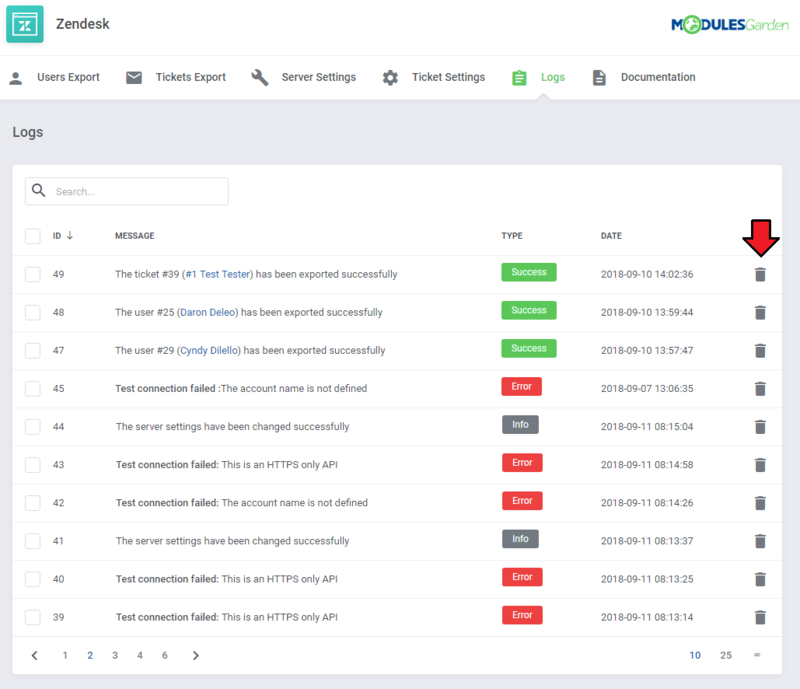 This is due to Zendesk trial account limitations, where you cannot use the API endpoint to bulk import users or organizations. A '403 Forbidden' error is returned. 4. Some of the module elements may not reflect immediate changes made in the Zednesk panel. This is due to the use of cache to limit the number of queries to APIs. E.g. the cache refreshing time for the ticket list and replies is 30 seconds. The update of brands, ticket fields and departments can take up to 18 minutes and clients even 54 minutes. If you need the immediate cache refreshment, go to the 'Ticket Settings' or save 'Sever Settings' again. 5. 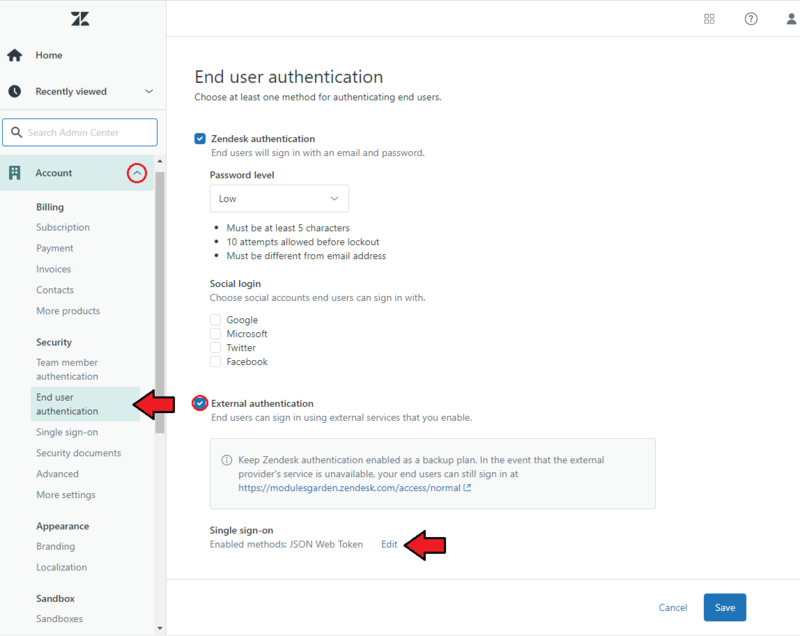 If you are using the 'Contact Us Integration' option with Zendesk, you must remember to previously remove the standard WHMCS settings for this option. Move to WHMCS → Setup → General Settings → Mail and remove the 'Presales Form Destination' and 'Presales Contact Form Email' input. Otherwise, the visitor will be redirected to a login page. This page was last modified on 28 February 2019, at 16:10.